(POW/EVD) 22 February 1944. Mission #111 to Aschersleben, Germany in B-17G #42-31399 (no name) (360BS) PU-F. German fighters inflicted a hole in the wing. The #4 engine prop windmilled and the B-17 went down in a shallow dive. The loss of gas from the damaged wing led to the conclusion that they could not reach England or Sweden. They decided to ditch in the North Sea. They were then hit by two ME-109s and elected to make a crash landing in Holland. Two crewmen bailed out. The rest of the crew stayed with their damaged B-17 and crash landed at Wij Bij Duurstede, The Netherlands, 30 km southeast of Utrecht, near Ziest. 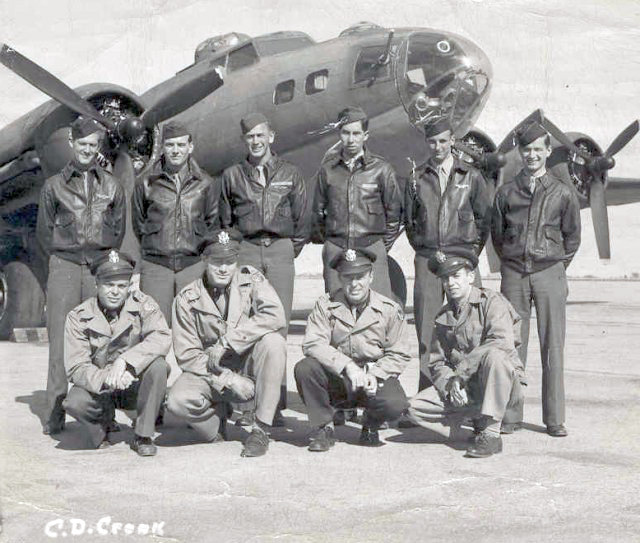 1Lt Crook was on his 12th combat mission, as were most of the other crewmen. Substitute CoPilot crewman: Regular CoPilot 1Lt Ernest N. Evans was hospitalized on 22 February 1944 and substitute CoPilot, 2Lt William A. Clark (CP)(POW) was flying with the Crook Crew. He had flown six previous mission as CoPilot with five different Pilots and never was assigned to a regular crew. Lt Evans went on to complete his combat tour and was upgraded from CoPilot to Pilot on 28 May 1944. He flew 14 missions as a 1st Pilot completing his combat tour on 20 June 1944. S/Sgt Ray A Cheek (BTG) bailed out, evaded capture and returned to England on 26 January 1945. F/O Joseph DeLuca (B) evaded capture returning on 14 September 1944. Sgt Salvador Chavez (RWG) also evaded returning on 15 September 1944. T/Sgt Louis H. Breitenbach (E) and Sgt James H. Hensley (TG) stayed together and evaded capture for four months. They contacted members of the Oranje Brigade of the Dutch Underground and moved around the Netherlands staying with various Dutch families. On 24 June 1944, after moving to Liege, Belgium, their remarkable period of evasion ended. They were captured by German Soldiers who were searching all of the houses in the area looking for downed airmen who had been hiding. Sgt Robert J. Hannan (R) also made contact with the Dutch Underground. He joined the underground and became a "Freedom Fighter". He took part in helping other downed airmen evade capture working on the "Comet Line" and took part in train raids and other actions to harass the Germans. He was finally liberated by British troops who were driving the Germans out of Holland. He was considered a hero by the Dutch Government as were many of the Dutch friends with whom he worked. The stories of Sgt's Breitenbach, Hensley and Hannan are full of many instances of bravery of the Dutch Underground. 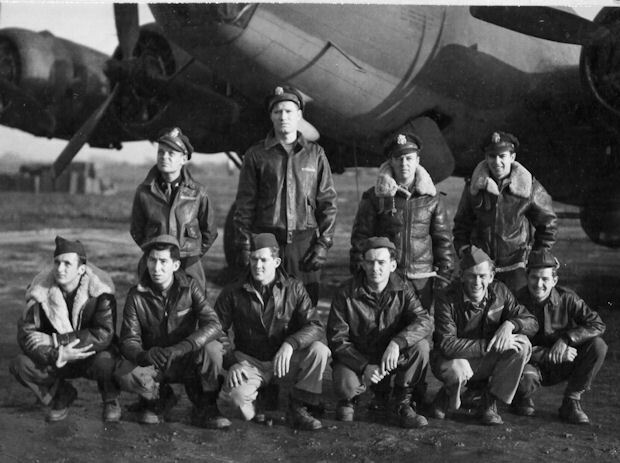 Daily they risked capture, torture and death for helping downed Allied fliers. Many died in their underground activities. The wartime heroics of the Dutch Underground members still deserve greater praise and recognition for their wartime exploits. We had come down "to the deck" which was about 1,300 feet and we flew just above the clouds, ready to go into them if a fighter should show up. For some time we flew along, keeping "cloud cover," and then it happened. We were twenty minutes from the coast and the clouds ceased to exist. We were in the open and an FW-190 had spotted us. He came from below and at the rear. The rear guns were out and he was too low for the other gunners to shoot at. He gave us a burst of machine gun fire and the shells ripped through the ship. Our pilot was doing some beautiful flying, but we were defenseless and the German came in from the left and to the rear again. We could see his whole wing light up with orange flame from his machine gun and cannon fire. We fired the best we could, but it only took a split second for him to get us in his sights and fire away. His bullets came crashing into the plane, knocking out two more engines. A cannon shell passed between the two waist gunners, missing them by inches and blew a machine gun off its position and out into the air. One of the waist gunners later remarked, "I guess my mother was praying for me." You will have to realize that what is taking minutes to tell, only took seconds to happen. The order came, "stop firing." We were going to crash-land. We were going down and we were too low for all of us to jump in safety. Two of the crew had jumped before anyone knew it and because of their action we were able to flee in safety later on. Everyone was climbing into their positions for the crash-landing: the pilot, copilot, bombardier, navigator, and the engineer in the front cabin and the tail gunner, radio operator, and one waist gunner in the radio compartment. Things happened so fast, it is hard to say what really happened. We were all crouched down and waiting for the first bounce. It came and plenty hard. We bounced up into the air, came down again with a loud crash, and were sliding along the ground, taking fences and everything along with us. Things were flying all around inside the ship: ammunition, radio sets, flares, and boxes of all kinds. A thousand thoughts passed before me. Will the plane catch fire and blow up? Will we crash into a house? The feelings of terror and suspense that gripped us can't be put on paper. We were still sliding and then we stopped with a jolt. The front of the plane was in the water of a pond and the tail was bent and pointing into the air. The pilot opened the window and they crawled out of the plane. The bombardier had put on his parachute and was too nervous to get it off by himself. I helped him take it off as he was blocking the exit. In the meantime, the German plane was circling the wreckage and suddenly dove down and strafed the ship. There were still five of us in the plane and shells were hitting everywhere. A shell hit an ammunition box and they started to explode, adding to our discomfort. It was a miracle that no one was injured in any way, We finally managed to crawl out, the men in the radio compartment having to wade in knee-deep, ice-covered water to reach the embankment. We decided to get away as fast as we could. One man who parachuted out took a boat and crossed a river. The Germans, thinking all of us had done the same, searched that side of the river first.